The food at Little Italy is splendid – standouts include calamari fritti and the eggplant appetizer, delicious sauces, and an exquisite raspberry sorbet-and-chocolate dessert called “Amore.” These thoughtfully prepared dishes are expertly served in a narrow, old, frame house, now expanded to include a bar. 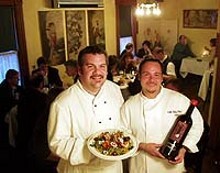 Won Most Romantic Restaurant in our 2007 Best of Issue. With its soft lights, white tablecloths and private alcoves tucked into a Victorian house, Little Italy lends itself to amorous murmurs.